Valid at Spencer's stores across India. Click here to locate the store near you. Valid for 1 year from the date of issue. 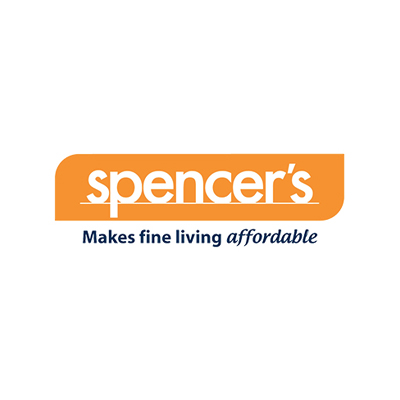 Spencer's Retail Limited, part of RP Sanjiv Goenka Group, is a multi-format retailer providing a wide range of quality products across categories such as food, personal care, fashion, home essentials, electrical & electronics to its consumers. It has specialty sections such as Spencer's Gourmet, Patisserie, Wine & Liquor, Epicuisine and an in-house designed fashion brand - 2Bme, which has apparels for men, women and children. 1. In this deal, you will you get an open voucher through which you can purchase any product. 2. Valid at Spencer's stores across India. Click here to locate the store near you. 3. Valid for a period of 1 year from the date of issue. 4. The voucher cannot be revalidated in any case. However, the validity of the voucher may differ without prior notice based on corporate deals. 5. The voucher can be used only once. 6. Partial redemption is not allowed. 7. The voucher can't be exchanged for cash. 8. Once this voucher is purchased, it cannot be cancelled. 9. Spencer's shall not be liable and responsible for any unauthorized and/or fraudulent purchase/s made using the card. The holder of this card shall be solely responsible for the safe custody of the card and the credentials mentioned on it. 10. If purchase value exceeds the balance of the voucher, the order balance must be paid with credit/debit/prepaid card or cash at the time of purchase. 11. Spencer's reserves the right to modify/amend the rules or associated benefits with this voucher without prior intimation. 12. For balance enquiry & expiry, call us at toll-free no-1800 266 0134 (All days operational-8.00 a.m -10 p.m). 13. Users who have not undergone Paytm KYC will not receive cashback in their wallets. Visit the Spencer's store to redeem the value of the voucher. Share the voucher with the cashier at the time of billing to redeem it. 1. You will get a Paytm Movie Voucher worth Rs.150. 2. The code is applicable on minimum purchase of 2 tickets. 3. The code can be used for booking tickets on paytm.com and Paytm App. 4. The code is valid for 30 days. 5. The minimum booking amount is Rs.300. 1. You will get a Paytm Electricity voucher worth Rs.120. 2. Applicable on payment of 1 Electricity bill through Paytm App/Website. 3. The code is valid for 30 days. 4. The minimum cart value is Rs.700.